GPR cross section of the burial mound An inside stone mound (1) and the central tomb, covered with stone (2) are clearly seen. 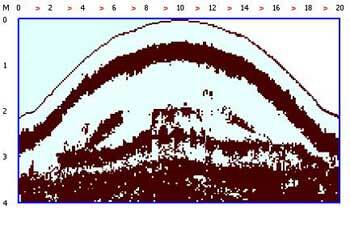 GPR prospecting was conducted in 2002. Robbers' prospect hole and the entrance to the burial. 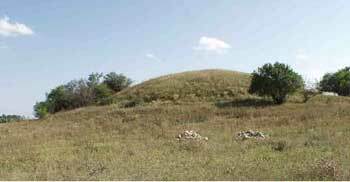 In 2003 this tumulus was robbed by the "black archeologists". 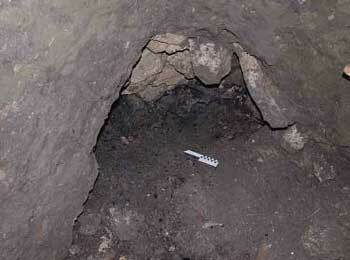 Robbers dug a vertical prospect-hole in the center of the tumulus. As the burial ground was examined, after robbing, we corroborate the primary version of its construction, age and origin.